Artist’s Statement For nearly 50 years I have created stained glass windows and lamps as commission pieces. Some of these are in public places including the Centerville Library, Sugarhouse Library, Kol Ami Temple, Church of the Resurrection (Centerville), Rowland Hall School. My glass lamps, along with steel work by my husband, David, were shown at the Salt Lake City Art Barn in 2013 in a show entitled, "On the Light Side". Most of my windows, however, are in private homes throughout the valley. Only since retiring in 2005 did I begin my love affair with pottery. My works are hand-built as I enjoy finding the limits of this medium as I roll, fold and pinch it into sculptural forms. 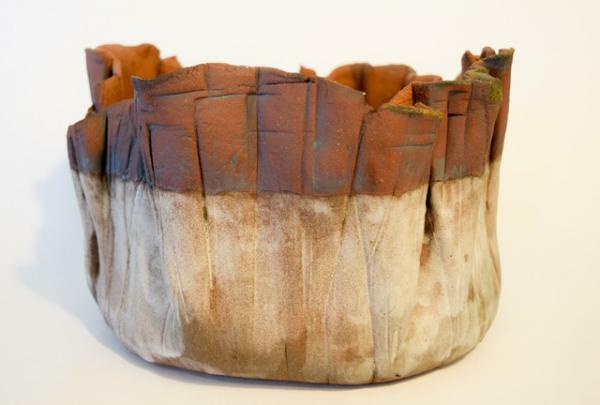 The natural textures and colors of the clay are used in my work to create organic and irregular shapes. I want my pottery to reflect the process of its creation…as if it is still emerging from the lump of clay I began with. Nancy Starks Biography As a Utah native, I have always enjoyed the flourishing art scene here in Salt Lake. I spent many years teaching kindergarten at Rowland Hall and then taught art classes at Madeleine Choir School. There are few arts or crafts in which I have not worked and played. Being involved with the arts community in Salt Lake City for many years, I served on the Salt Lake Arts Council Board as Vice Chair with Nancy Boscoff, Director. While there I helped to oversee planning, budget and also participated on the Gallery Committee to plan and curate upcoming shows for Finch Lane. I later became a member of the Art Access Board. This organization is committed to providing the traditionally underserved members of the Salt Lake Community with opportunities to learn and show their artistic works through workshops, mentorships and gallery shows. My involvement there was serving on various committees and as Vice Chairman of the Board.